Grier’s scramble for the pylon came after he threaded a 33-yard touchdown pass to Gary Jennings with 16 seconds left, a perfect throw that Jennings caught in stride in the back of the end zone behind two defenders. West Virginia linebacker David Long couldn’t watch. Texas coach Tom Herman didn’t seem to care for Grier’s pre-score celebration. Sills caught touchdown passes of 60 and 18 yards for the Mountaineers. Ehlinger passed for 356 yards and three scores and also ran for a touchdown for Texas (6-3, 4-2, No. 17 CFP), which has lost two in a row after three weeks in first place in the Big 12. “The silver lining is we play in the Big 12. We’re not out of any race at this point,” Herman said. “We certainly don’t control our own destiny. 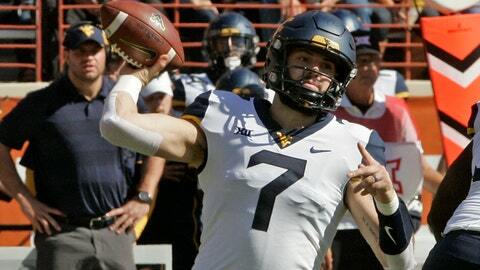 West Virginia: The Mountaineers got a huge effort in the running game to complement Grier, and the defense held on just enough to force the Longhorns to kick two field goals that kept them in range for Grier’s late-game magic. The Mountaineers ran through the Texas defense for 232 yards. Martell Pettaway rushed for 121 yards on nine carries and scored on runs of 55 and 13 yards. Texas: Injuries have become a problem while Texas has stumbled into the second half of its season. Starting safety Brandon Jones didn’t play because he aggravated an ankle injury before the game at the team hotel, starting cornerback Davante Davis was knocked out on the first series with a shoulder and neck sprain and edge rusher Breckyn Hager dislocated his left shoulder in the first half. West Virginia was penalized 14 times, eight in the first quarter alone. None were bigger than a pair of calls after Sills scored on a 60-yard touchdown pass. Sills was flagged for unsportsmanlike conduct for flashing a “horns down” hand sign after the score. Then starting left tackle Yodny Cajuste was ejected after another unsportsmanlike call for throwing a punch on the extra point. The Mountaineers kicked off from their own 3 and Texas used three plays to drive the short field for a touchdown. Big 12 Assistant Commissioner Bob Burda said the penalty for the “horns down” hand signal is “solely at the official’s discretion” and he is unaware of whether teams have been warned not to do it when playing Texas. “Here is what I’m disappointed about: We communicated with the refs if that thing was going to get called. I guess there was miscommunication,” Holgorsen said, declining to say what game officials had told him before kickoff. Texas couldn’t get to Grier and gave up 578 total yards. The Mountaineers didn’t allow a sack despite losing Cajuste. Backup left tackle Kelby Wickline had a huge game against Texas sack leader defensive end Charles Omenihu, who had two tackles and no quarterback hurries. West Virginia should get a boost for a big road win against a much improved Texas team compared to last season. The Longhorns likely drift back toward the bottom of the Top 25 after another game where the defense struggled again.